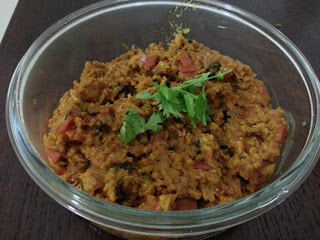 Kheema is a minced meat accompaniment made either dry or as a semi gravy. Kheema can be paired with Khichdi or can be had as a side dish with daal chawal. You can also have kheema with roti, poori, naan and even dosa. You can sandwich kheema between bread slices and grill or toast it. You can use it as a filling for puffs and stuffed breads. There are so many different ways you can use the same recipe by just adjusting the consistency. I made it today with khichdi and till ka khatta. This recipe is very similar to how my mom prepares it with a few changes here and there by me. 1. Wash and clean the mince. I use a steel mesh (colander) to make it easy to clean. Drain all water by pressing through the mesh and keep aside. 2. In a non-stick vessel heat oil. 3. Add onions and fry them till they turn translucent. 4. Add the mince and stir well to break the pieces or else it will turn into lumps. 5. When the mince starts turning white, add the garam masala and fry for a minute. 6. Add ginger garlic paste and fry again for a minute. 7. Add turmeric powder, chilli powder, coriander powder and salt and mix well. 8. After a minute add the yogurt and fry it for 5 minutes. 9. Add the chopped tomatoes if using and mix well. 10. Now cover and let it cook for about 10 minutes mixing it a couple of times in between. 11. Add water if needed. 12. Add the coriander leaves and stir well. 13. After 10 minutes remove the cover and keep stirring often till the oil starts separating from the sides. 1. You can make it into a semi gravy by adding water instead of frying till it starts separating oil. 2. You can add green peas at step 5 or boiled green peas at step 11.